Like many young boys my generation, I used to own a balisong back in the seventies when I was in high school. Not that I ever intended to use it. It was just one of those things one kept for a just-in-case moment, not to mention owning one brought with it some level of prestige. Besides, because all other ethnicities in this country thought all Batangueños carried a balisong, it felt almost obligatory to reinforce the stereotype and own one. Because I was on a tight high school budget, my balisong was not the expensive sort at all. Still, it was crafted in the town of Taal in Batangas, famous for the balisong at the time as it was for barong Tagalog. It had a beautifully carved horn handle, from whence, it is generally believed, the name balisong – “baling sungay” or broken horn – was coined. Alternatively, the balisong is also known worldwide as the butterfly or fan knife after the way its two handles open from being a compact tool with the blade hidden. It is also sometimes called the Batangas knife2, likely because its manufacture is an industry in the province but most particularly in Taal, where there is even a village called Balisong. There is a village in the heritage town of Taal in Batangas that is named after the Batangas knife. What we as teenagers took as fact was that the balisong was a Batangueño invention, despite its apparent worldwide fame. It was not uncommon, for instance, to see such a knife used in a Hollywood gangster movie. However, I am belatedly discovering that the balisong may not even be a Batangueño invention at all. Audra Draper of the web site “The Balisong Collector’s Page,” however, has an alternative theory; and this one is backed by historical documentation. Draper cites a French book published in 1710 called “Le Perret,” which includes a sketch of the design of the balisong. A copy of the book is available at the Museum of Thiers in France. If, indeed, the balisong was invented in France, then it was a matter of time before its use spread to European neighbors Germany, England and Spain. It is entirely plausible that a balisong might have crossed the oceans to the Philippines brought along by a Spaniard, and the timeframe of the “Le Perret” certainly coincided with the Spanish colonial era in the Philippines. Whatever the year, a direct consequence of de Leon’s manufacture of the first Filipino balisong is the spawning and growth of the balisong manufacturing industry in the village that will eventually be named after the knife. Even in the present day, the roads of the village are lined with stalls and shops selling balisongs of countless designs. American soldiers returning home to the United States from duty in Batangas brought home balisongs. Image credit: Wayne Violette. 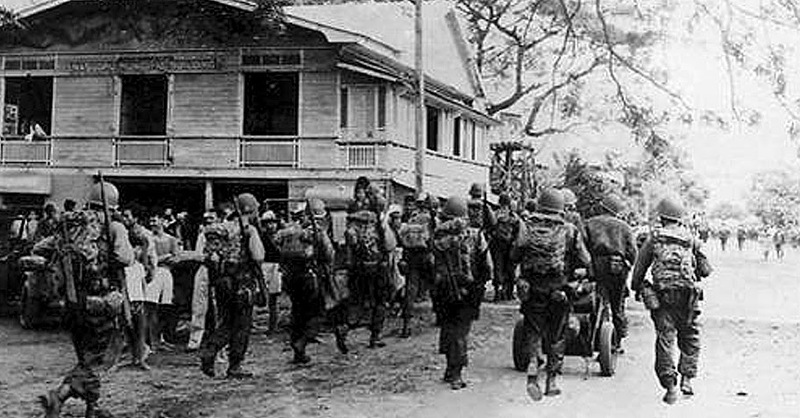 American troops marching into Nasugbu town after the beach landing. The subsequent growth in popularity of the balisong worldwide, and particularly so in the United States, was down to soldiers of the United States Sixth and Eighth Armies who participated in operations to liberate Batangas from Japanese rule in the forties as well as post-war reparation efforts afterwards. Many of these soldiers, upon their return to the United States after the war, brought home with them balisongs probably as souvenirs. Although the debate continues about where the first butterfly knife was actually created, that it matters is probably less significant. After all, the word balisong has found its way into English dictionaries and is frequently described in worldwide web sites as a Filipino knife manufactured in Batangas. Hardly anyone, if at all, calls it a European knife. 1 Advanced English Dictionary, Cosmos Chong, Developer. 3 “Balisong History,” online at Balisong, Balls and Bandages. 5 “Balisong History,” online at Pinoy Steel. 6 “Arnis: Reflections on the History and Development of Filipino Martial Arts,” by Mark V. Wiley, 2001.